Two days (8.6.2006 and 9.6.2006) in Prague and near neighbourhood was very good for halos. The best halo display had Martin Nekola in Ondrejov, he was seen nice Wegener arcs in high Sun elevation (approximately 55 degrees) as big X on anthelion side of Sun. Web site of some next Martin´s halo photos is here. Wow very nice!!! all we have had is poorly formed common halos in Ohio USA. I did get rainbow with anticrepuscular rays a week ago though. Great X of Wegener arc! Is there a trace of Hastings arc on down right "leg" of the Wegener arcs X? 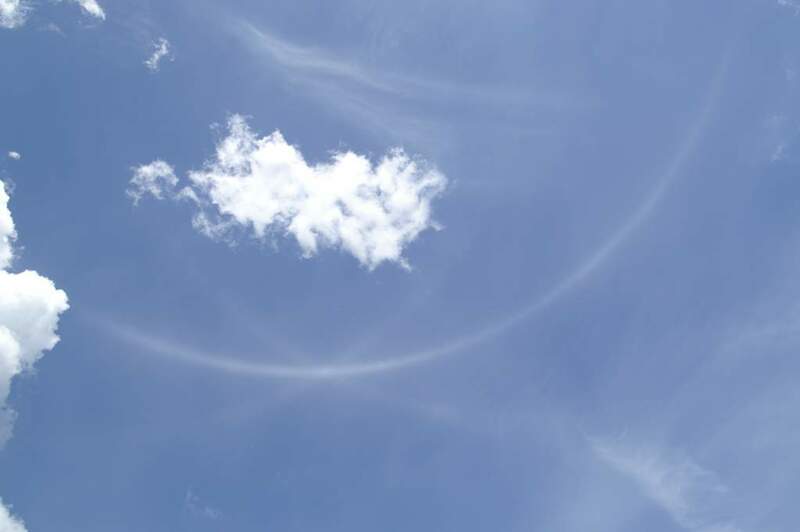 It seems to split into two arcs. That lower could be a Hastings arc and upper Wegener arc. Jarmo, I was say for Hastings arc too. But I think, it will first Hastings arc on cirrostratus...oh no, it is impossible..and in Czech? No...BUT I seen your comment now and I hope for it! Martin have better photos, I will ask for it. Hasings arc? I don't think I saw any splitting of the arcs. I did a simulation of that display with singly and parry oriented columns and I can see seperation between hasting and wegener. Claudia: no, it is Hastings arc. Jarmo, Marko: ok, I try normal (no fisheye) simulation. What was seen nearby/around the sun? Only 22deg column arcs, or also 22deg Parry oriented halos? To Peter: around the Sun was clouds (cumulus), but Martin have some photos from compact camera with fisheye. I hope for Parry. If so it would be useful to post the simulation file so that we can run it too and we can also see what crystal parameters have been chosen. are you sure thats hastings?